Home > The Basics > Who Performs Animal Testing? Animal testing may conjure up the image of a dubious, remote laboratory but the reality is that animal testing is performed in countless places around the world. It occurs in universities, medical schools, pharmaceutical workplaces and military defence establishments. One of the reasons it occurs in such a great number of places is because its applications are so broad. Universities are often at the forefront of research that uses animal testing. Research students led by experienced scientists use animals to better understand how the human body works as well as look at pharmaceuticals and drug development. Universities are quite often in the limelight, which means their treatment of animals is well scrutinised. Still, offences have occurred at universities, such as previous primate experiments at the University of Cambridge. 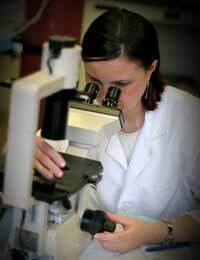 Medical research is considered integral to medical understanding and progress. For this reason, medical schools are generally avid supporters of animal testing for improving knowledge and health outcomes in disease prevention, treatment and overall management. At the same time, medical schools are also strong supporters of animal testing alternatives whenever appropriate. In fact, even in the teaching of medical students, new methods are being used as an alternative to animal testing. Some of the leading, highly respected universities in the United States and Britain are using innovative, interactive clinical teaching methods to replace the more old-fashioned types of laboratories. The pharmaceutical industry is a billion dollar one, with enormous competition to find the next breakthrough drug. Any new drug requires rigorous pharmaceutical testing to ensure its safety. Prior to performing human clinical trials, drugs require preliminary testing on animals. Many drugs won't ever make it beyond this stage, which is precisely why they are tested on animals rather than immediately on humans. This allows researchers to understand how the drugs are metabolised and how they affect the various body systems. It also allows researchers to determine their efficacy. Efficacy, however, must not carry an unacceptable level of risk, which means that a drug working for the intended purpose in an animal is not cause enough to move forward to human trials if the drug causes major side effects, harm or death. Many are not aware but animal testing occurs quite regularly in military establishments. One important reason for their use is to protect the military and the general public from weapons and tactics that may be used by other countries. The military performs animal testing to determine how various weapons such as viruses will affect the intended recipients. By using animals, they can gauge the effect and develop the means to prevent and successfully handle the consequences. For the former, this might mean developing vaccines and for the latter, this could mean creating medications to treat those affected, particularly on a wide scale should an enormous number of people be affected. Other testing uses include wound testing where the military examines how various weapons create wounds as well as how those wounds heal. Animal testing remains an important part of knowledge and progress by a wide range of researchers. You may already be aware of some of the establishments who perform animal testing while others could be new to you. Animal rights activists do sometimes target specific groups, particularly if a highly publicised abuse has occurred. Ultimately, all groups who perform animal testing should be strictly monitored to ensure they perform animal testing with respect and care. It has always horrified me that there are any humans capable of personally acting in a manner that is visibly and audibly causingan animal to suffer.Such behaviour shows a dangerous lack of empathy. There is no doubt in my mind such people are quite deranged -there is obviously something profoundly wrong with anyone who can witness blatant suffering of an innocent being and just keep on doing that.No one will convince me otherwise. I'm writing a paper for school about animal testing and this is definitely helping me. ALL animal testing that causes pain to a living sentient being should be banned. Animal testing is nothing more than sadistic torture that yields no worthwhile results. Anyone inflicting pain on an innocent helpless being is committing crimes against nature in the name of science. It is already a well-established fact that there are methods that involve no need for using animals in experiments that are accurate and effective. The Physicians Committe on Responsible Medicine knows this, as do many places in the US (and abroad) that have given up this barbaric practice by butchers in white coats with no hearts and souls who could care less about the screams and cries of animals. cruelty and torture are pretty with a well worded bow on top. Very helpful for my research paper on the benefits and ethics of animal testing!